Young children can lose primary (baby) teeth and even immature permanent teeth when the pulp, the living tissue inside a tooth, becomes infected. 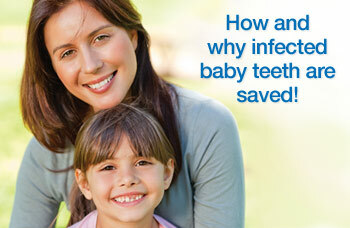 This is often the result of trauma or dental caries (tooth decay) and creates a special problem for the child. The primary teeth provide important guides for the newly developing permanent teeth that will replace them. And injury resulting in loss of young permanent teeth can be even more troublesome, because neither tooth development, nor jaw growth is complete. If teeth are lost prematurely, a malocclusion (“mal” – bad; “occlusion” – bite) can easily result. Tooth replacement techniques such as partial dentures, bridgework and dental implants cannot easily be used in children while everything is changing and growing so rapidly. “Space maintainers,” specially made appliances that can be attached to adjacent teeth or fabricated in a removable “retainer” style, are generally the best choice. Yet many do not restore function, and all require constant monitoring. For both functional and cosmetic reasons, endodontic (“endo” – inside; “dont” – tooth) or root canal treatment is preferable to tooth loss. It can preserve tooth, jaw and tongue function. It can also prevent speech problems, and abnormal eruption of a permanent successor tooth, or even the loss of a tooth that has no successor. 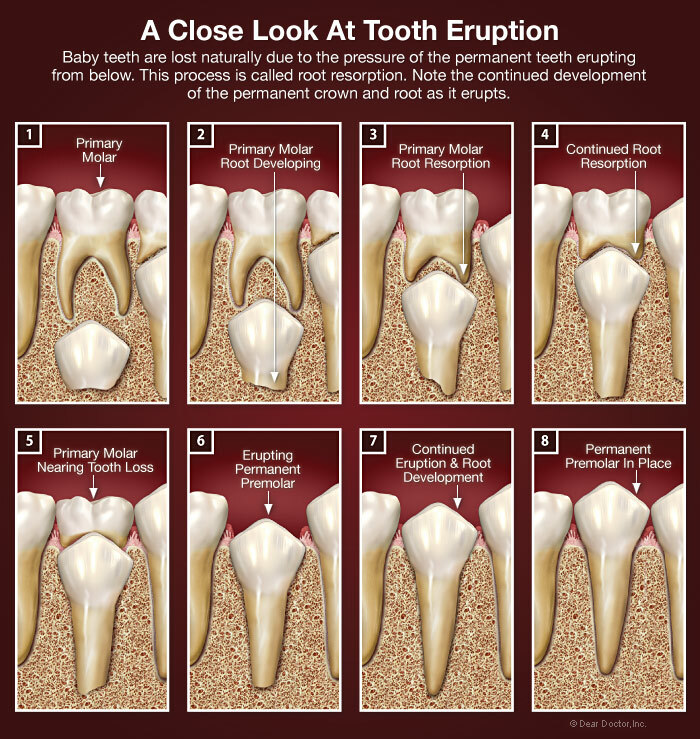 Baby teeth are lost naturally due to the pressure of the permanent teeth erupting from below. 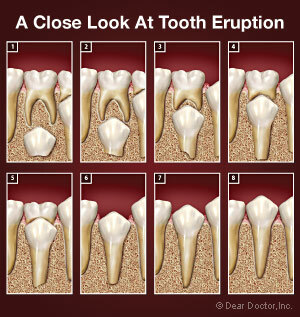 This process is called root resorption. Note the continued development of the permanent crown and root as it erupts. What follows is a guide to understanding what to look for in your child and what can be done to save baby teeth until they are ready to be lost naturally. Special endodontic treatment techniques for immature permanent teeth will be covered in a subsequent article. Many things are different when dealing with primary teeth versus permanent teeth. Their survival is shorter and more temporary, but while their shapes, structure and functioning are similar to permanent teeth, they too have differences. Treatment of root canal problems is affected by root resorption, the normal process by which the body absorbs the roots of the baby teeth to allow for eruption of the succeeding permanent teeth. This complicates the diagnosis and, therefore, appropriate treatment.